Member Support – Who Are They? EzineArticles Member Support team’s role is in assisting members with direct questions related to their membership account. The three of them address 500+ email-based questions daily. They have shared some details about themselves and also offered a few tips to help you get answers faster or in some cases alleviate the need to contact support all-together. Kirk enjoys listening to and making music, watching films, playing disc golf and softball, and spending time with his girlfriend. He also likes goofing around online despite spending over 8 hours a day elbow-deep in the internet. Tip 1: Keep syndication in mind. Do not make your article dependent on images, graphs, charts, bolded text, etc. because these things can be ‘lost in translation’. SIMPLIFY. Don’t paste from MS Word. Use plain text editors like NotePad. If you are going to paste from MS Word, use the “PASTE FROM WORD” tool within the WYSIWYG editor. Tip 2: Use your real name, upload an [author photo] image, and use the same name and image everywhere. This builds on your brand and your credibility. Briana enjoys reading Jodi Picoult novels in her spare time and spending time with her family. She also loves to travel and experience new places. Her favorite season is summer and if she could wear flip flops all year round in Wisconsin, she would gladly do so. Tip 1: Understand the difference between the article body and resource box. Save your links and hard sell for the resource box, and make your article submission genuinely informative. Tip 2: Make use of all of the free article writing & marketing training that we provide to you. Wade runs a local Karaoke show and loves to sing and play guitar. He also enjoys golf, (sometimes softball) and is eagerly anticipating summer as he is an avid Harley Davidson motorcycle rider. Tip 1: ALL your messages are read and responded to, so there is no need to write multiple messages on the same issue. When writing in on account related issues, you can save your time and ours by writing in from your EzineArticles membership interface (also known as the “Authors Area”). We prioritize member support queries ahead of people who use our public contact us page. Tip 2: Think of the user experience. Make sure the reader really gains value from your article and website. If your primary interest is the reader’s experience, it will show in the quality of your articles and website, and less articles will be rejected requiring less support from us. Since we launched our email-based ticket support system, 191,191 incoming tickets have been recorded. Last month, we processed 18,443 email support tickets from members and non-members. Kirk leads the pack with 21,235 support tickets answered, followed by Wade with 13,880 tickets responded to and Briana with 1,202 tickets answered just joined our Member support team. 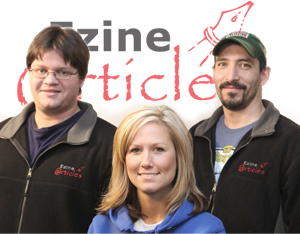 All 3 of our Member Support team members were previously EzineArticles Editors/article reviewers or part of our Quality Control Editorial team. We hope you enjoyed today’s look into our Member Support team. Again you`ve given us a glimpse behind the scenes. Thanks. It always helps to see the faces behind the names. “Kirk enjoys listening to and making music, watching films, playing disc golf” disc golf? Is that an American game, not sure I`ve heard of it here in the UK. I have been submitting my posts by MS word and I see that they have been accepted. Must I put them in notepad? Did they come through OK? 1) You have your EzineArticles WYSIWYG editor disabled. 2) If you’re using the WYSIWYG editor enabled, then ONLY use the “POST FROM WORD” tool when pasting it into the Editor, otherwise, it’ll include hidden junk characters that we have to then manually strip out. It’s nice to meet those behind the scene. Thanks for the help on several occasions. Nice to know about MS Word and the WYSWYG. Have a nice weekend and a Happy Valentines Day! I replied to your answer, but do not know if it went through.Are my posts coming throguh OK? I am not particularily swift with the computer. Thanks Christopher. I am inspired and proud to be contributing to EzineArticles that has such an excellent support team. Nice intro team, and some good tips! Also wanted to say thanks to your newest member, Briana. I’ve had a few exchanges with her and found her to be both pleasant and helpful! Thanks Guys, and Gal. I’m sure we all appreciate the hard work you give. I for one do, thanks!!! I used to use Notepad but now use I Notetab Light which has keyword density and word count tools. I liked Kirk’s first tip about keeping syndication in mind. My first articles contained some html for making text bold, italic or a numbered list. I stopped doing that when I saw one of my syndicated articles on another website. The publisher did not keep the formatting and it did not look display right. Now I try to keep it as simple as possible. I keep any hyperlinks for the resource box at the bottom. I have used the Author’s area messaging system before and the responses have always been quick and friendly. Thank you to the member support team. I had interaction and debate with Kirk… but never had an opportunity to ineteract with others. I know it’s real hard work involved. But you guys have really done a good job. Congratulations Kirk, Briana and Wade !! It is a very big and hard work for you, thank you support so good services. You know, after reading through all the warm and fuzzy posts, it occured to me that an author group here at EzineArticles would be an excellent idea. Maybe something along the lines with what Facebook does. You’ll be happy to know that such a community already exists on FaceBook. Check out the EzineArticles FaceBook Community to learn more. I just wanted to publicly thank and acknowledge Briana for helping me figure out some snarky things that were going on with one of my articles. Briana was clear in her responses, really fast in replying, and supportive the whole time (even when I inadvertently messed it up and we had to start over). Thanks Briana! And also thanks to the entire support crew. We appreciate you more than you know! Attending to millions of submission is hard. You guys do it. Nice job you all.